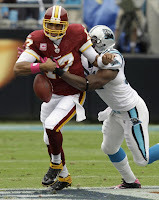 Jason Campbell fumbles #8 on the season 5 minutes into the game. The NFL record on a year is 23. I know that I'm riding JC and this isn't all his fault. The O line holds some of the blame. Also, Zorn still just coaching JC not to make mistakes. A 145 yd passing game is terrible.